This report will look to analyse investment drivers within the Milan market, how the EXPO contributed to investment growth, the commercial real estate market, and provide recommendations on the best investment opportunities. Milan is a key part of the Italian economy and it estimates to generate 10% of the Italian economy, with the Lombardy region generating 20%. 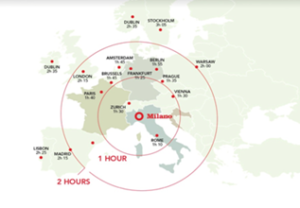 Milan has very good infrastructure being an hour away from the three international airports.It is also well connected internally, having tram, bus, and metro which connected the whole city together. It is seen as the southern European hub. Italy has struggled in recent years, but is still the 4th largest economy in Europe and is expected to experience positive growth in the next four years of over 1%. 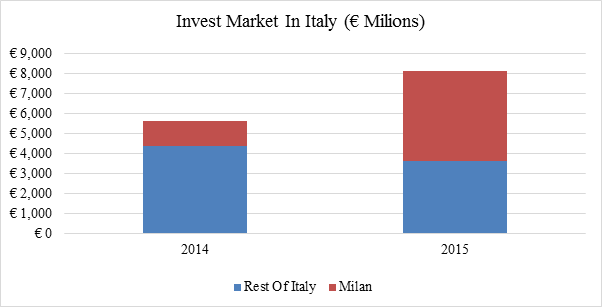 Milan contributed over ¼ of investment volume in 2014 and over ½ in 2015. The Expo attracted over 20 million visitors with over 25% coming from abroad. It is estimated that in cost €3bn in infrastructure, however, brought in over €6bn and generated value of +0.1% of total Italian GDP. The Expo was a huge success for Milan, however the area has not got a definitive plan on what it will now be used for and worries are that it will go to waste. Milan saw a 35% increase in office take-up between 2014 and 2015. Most of the current building available are Grade B and C making up 78% of the space. The prime rent currently is €480 which have been very stagnant between 2005 – 2015. The office investment market has been very strong with a high increase in non-domestic investment reaching nearly €3,000 million of total investments. The biggest investment was made by the China Fosun Property through investing €345m in Palazzo Broggi. Milan is one of the top retail destinations in Europe with prime high street rent of €833 per sqm. Shopping Centre retail rents are much lower at €71 per sqm. Prime high street yield is currently about 4.75% and shopping Centre is 6.5%. Industrial sector had the least amount in the commercial sector at €0.3M. This, therefore, is the highest since 2007. Prime rents currently stand at €4.25 with a five-year growth rate of -1.5%. However, the increase in e-commerce experienced industrial prices, rising as more warehouse space is needed to accommodate storage facilities. The first recommendation would be to invest in the office sector of Milan. This is due to the Expo space that could be put to use and the Grade A office is in need of development in Milan. The second recommendation would be the necessity of investment in the industrial sector. It hasn’t seen growth in the past five years in terms of rents, however as ecommerce sales increase, industrial space will become more in demand which should see an increase in prices in the long term. This report will provide the key drivers of investment within the Milan market. The EXPO contributed a huge amount to Milan’s economy and Italy’s as a whole in 2015. It attracted millions of potential investors into Milan and was a huge success. However, the future of the space still has no settled plan. Therefore, this report will look into the potential for this space. It will finally look more widely into the commercial real estate market and recommend the most attractive investment opportunities from the findings of this report. This section of the report will explore the economic trends within the Milan economy. The aim is to provide a wider understanding of Milan’s economy and the impact it is having towards Italy. It will look into key statistics such as the population, GDP growth, infrastructure, and GVA. It will further look into projects which have been undertaken in Milan, within the last few years and future investment opportunities. Milan has currently got seven universities with the Università Commerciale Luigi Bocconi being the highest ranked university in Italy and 5th in Europe, making it one of the most prestigious Universities to study. (Unibocconi, 2015) It has six other universities and seven research centres. Milan has established itself as a fashion capital of the world ranking top in 2009 and being a top contender year on year, however, it slipped to 12th in 2014. (Languagemonitor, 2014) Milan has the 2nd largest Exhibition Centre in Europe covering 470,000 m2 of floor space. It is used frequently, with more than 100 events held each year attracting 4.5 million visitors. These events also attract thousands of potential investors every year into Milan, increasing foreign direct investment. Italy has not managed to have the strongest recovery out of the recession, however it is still one of the biggest economies in the world in terms of GDP. It is currently the 4th largest economy in Europe and 8th in the world. (Statisticstimes, 2015) Unemployment has been a huge problem in Italy, but it could fall as low as 8.7% by 2020. (TradingEconomics, 2016) The Italian economy hasn’t seen growth as an economy in the past few years, but Milan continued to prosper. Italy as a whole is predicted to see growth rates of between 1%-1.5% by 2020 which will be an improvement and should increase consumer confidence. (Knoema, 2015) Finally, investment volumes in Italy have grown 55% from 2014 to 2015, Milan accounted for €4,550m of €8,146m which is over half of the total investment in Italy. Figure 3 shows the importance of Milan as a market in the Italian economy, this large increase of investment was partly due because of the Expo and strengthening belief of the Italian economy. (CBRE, 2015) Furthermore, foreign investment strongly contributed to this having invested 42% more in 2015 than 2014. The Expo was a beautiful demonstration of food culture and it also had a huge impact in the whole Italian economy. In the short term, it generated a value equal to +0.1% of Italian GDP in 2015. (Eulerhermes, 2015) The GDP growth rate in Italy has had four successive growth periods in a row which was certainly helped by the Expo as seen in figure 4.0, (TradingEconomics, 2016). Unemployment has also fallen by 1% in the past year in Italy and Milan is also following similar trends, (TradingEconomics, 2016). The Expo was a huge success for the Milan and more widely Italy. The area is currently being dismantled and countries have been given till June 2016 to vacate the area. There are worries that the area won’t be put to use. There’s yet to be a definitive plan of what the 272 acres of Expo area is going to be used for. Milan is encouraging for Investors to put the area to use and encouraging for major development of the site. (Asara, 2016) They don’t want to see the area be put to waste. It is likely that the government would subside part of the development as it would further boost Milan’s economy and create more jobs. Unemployment has been relatively high and this would help lowering it. The Expo area is already well connected with the city and has all the infrastructure needed in order for it to function. The original plan was to create an agricultural park with residential blocks, the research centres, and a National television production Centre. (Bianchini, 2015) However, there is currently a shortage in Grade A offices within the city and this area could be a perfect destination to develop new office buildings. This section of the report will focus on the commercial real estate market focusing on the office, retail, and industrial markets in Milan. It will further look into investor characteristics within each sector in the city and the recent purchases that have happened in the city. The office market take-up in Milan in 2015 was 350,000sqm which was approximately 35% higher than 2014 as seen in figure 5. (CBRE, 2015) This was primarily because of the strong growth in Q4, which saw a 372% increase compared to the same time last year. New leases made up 26% of the total take-up compared to 12% in 2014. (Knightfrank, 2015) Take-up was driven by the financial sector taking up 26% of offices leased. There is currently a shortage in Grade A space in Milan with Grade B and C making up 78% of the available space. (CBRE, 2015) Prime office rents have been relatively stagnant fluctuating between €450 – €525 between 2005 – 2015 as seen in figure 6. (Cushman & Wakefield, 2015) The growth in rents will be very minimal in the next two years. 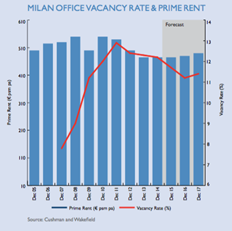 Vacancy rates have fallen year on year between 2010 – 2016, due to the increase in demand in office buildings which simultaneously has led to a drop in unemployment in Milan. 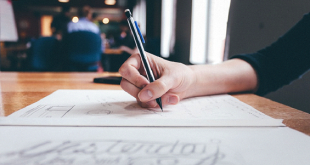 Vacancy rates are still relatively high at 11% and as new development becomes available within the next two years, it is expected that it will rise accordingly. Milan has been very stagnant compared to other major cities in Europe as in figure 7. (Cushman & Wakefield, 2015) This shows that the office market is struggling to recover from the recession, but it has seen positive growth in the past two years. This shows even though Milan isn’t at its strongest high street retail, it’s still performing significantly well. This is due to the low availability of shops in prime locations in Milan. The five main shopping districts are the main driver for such good performance in the high street retail market. Prime retail assets in Milan don’t come onto the market often, due to long leases that retailers take. The low availability of prime retail stores means they are often overpriced and don’t always make a good investment opportunity. The industrial sector has had the most difficulty throughout the recession and is still struggling. Industrial prime rents in Milan in 2015, where €4.25 sqm with a five-year growth rate of -1.5% CAGR. Prime yields in the industrial sector were the lowest in the main regions of Italy at 7.5%. (Cushman & Wakefield, 2015) Considering that Italy is the 4th largest country in Europe, it lacks to compete in the industrial real estate market ranking in the bottom half of European cities in terms of industrial prime rents as seen in figure 9. (Cushman & Wakefield, 2015) The prime yield 10-year low in Milan was 6.25% showing that the industrial sector still had a lot to recover, as it currently stands at 7.5%. Prime yields in the industrial sector are relatively high across Europe with the exception of London and Zürich being under 6% as seen in figure 10. (Cushman & Wakefield, 2015) However, high yields offer a better long term investment opportunity. The Milan real estate market constitutes mostly of retail and office buildings in the commercial real estate sector and there is limited availability in industrial stock. The long-term industrial real estate could become vitally important for cities around the world. E-commerce sales are growing on a daily basis and warehouse space is needed in order to keep down postal costs and improve delivery rates across the world. E-commerce sales grew to $19bn in 2015 in Italy and it’s expected to rise to $23.53bn by 2017. (Statista, 2016) Amazon launched ‘Prime Now’ in Italy in Piacenza which is a service which provides delivery within one hour. (Ecommerce news, 2015) With rising demand in Italy in the e-commerce sector, Milan will certainly take advantage of services and companies such as Amazon and might invest in stock closer to the city centre in order to provide a quicker service for its customers. 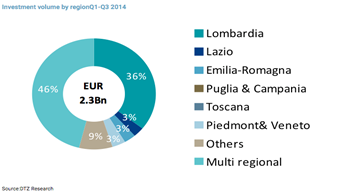 Milan and the Lombardia region are a key area of investment area. In 2014 it attracted 46% of total investment which was over €1bn as seen in figure 11. (Researchcentral, 2014) The majority of the investment went into office and retail. There has been a shift in investment pushing further into the office sector due to the strength of this sector. Industrial investment has remained relatively weak, but picked up between 2013 – 2015 seeing a year on year rise. But in comparison to office and retail, it has not managed to attract a significant amount of investment due to the limited availability. Domestic investment has slowed down in recent years and there has been an increase in foreign investment. (Researchcentral, 2014) Investments, such as the purchase of Palazzo Broggi have helped strengthen international presence in both the Italian market and more importantly Milan. The Expo as discussed above would have also been a key contributor to the increase in investment with the aim of attracting further investment to develop the ‘Rheo Fiera’ region in the near future. As an investment opportunity, Milan is becoming a very attractive proposition, especially within the real estate sector. The most attractive opportunity presented in this report is an investment in the Office sector in Milan. Prime rents, been very flat in the past ten years and growth is predicted to be relatively stable within the next two years at around 3%. The figures which make the office market stand out is the non-domestic demand, which has helped achieve the highest investment volume since 2006. 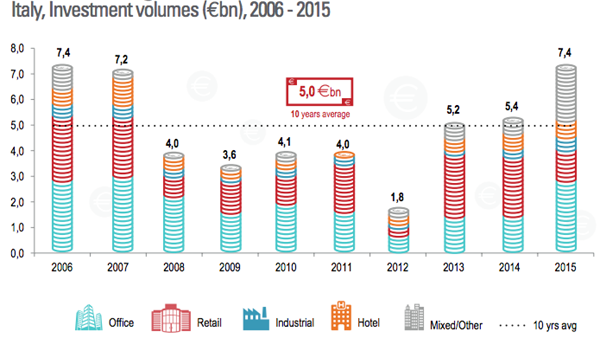 The Office market attracted nearly €3,000m in investment and it continued to thrive in the start of 2016. The Expo area has got 272 acres of land that need development. Furthermore, 78% of the offices currently available are grade B and C. Development in the Expo area might even get government subsidisation to investors as they wouldn’t want to see the area go unused. This represents a great opportunity to provide Grade A offices in the Expo area, which already has all the infrastructure needed in order to thrive. It will also provide with a less dense area for organisations looking for a more open space for their employees. The second investment opportunity would be in the industrial sector in Milan. This would be a riskier investment due to the performance of this sector within the past few years. The sector has seen -1.5% CAGR 5-year growth. It also has one of the lowest prime rents and the highest yield amongst the major cities in Europe. This represents a great long term investment opportunity as the industrial value is most likely under valued. It has seen a year on year growth on investment volume and trends are predicted to continue within the next few years. The biggest opportunity lies in the increase in demand in the ecommerce sector, which should drive industrial prices up in the long term. To conclude Milan has become a very desirable place for investors, especially for non-domestic investors. This has been partly due to the Expo as it attracted millions of potential investors from around the world into Milan. Italy is also expected to improve as an economy, not dramatically, but it should see positive growth within the next few years as consumer confidence rises. Commercial real estate has been a popular investment for people and companies all around the world. Milan is expected to receive further investment as new development is coming onto the market and demand to invest in one of the major European cities increases. Asara, V. (2014). Milan seeks investors for post Expo 2015 regeneration project. Available: https://propertyeu.info/Nieuws/9ec6fe018c9844fd8b954116fc5ef61c/Milan-seeks-investors-for-post-Expo-2015-regeneration-project. Last accessed 6th April 2016. Bertacche, B. (2015). These Are the Diverging Fates of Italy’s Two Greatest Cities. Available: http://www.bloomberg.com/news/articles/2015-08-05/these-are-the-diverging-fates-of-italy-s-two-greatest-cities. Last accessed 28th March 2016. Bianchini, R. (2015). The future of EXPO 2015 sails into troubled waters. Available: http://www.inexhibit.com/case-studies/future-expo-milan-2015-site-sails-troubled-waters/. Last accessed 31st March 2016. CBRE. (2015). Italy Investment Quarterly Market View Q4 2015.Available: http://www.cbre.it/it_en/contact_us/milan. Last accessed 2nd April 2016. CBRE. (2015). Milan Offices, Q4 2015. Available: http://www.cbre.it/it_en/contact_us/milan. Last accessed 5th April 2016. CBRE. (2015). Italy Retail, Q4 2015. Available: http://www.cbre.it/it_en/contact_us/milan. Last accessed 5th April 2016. Cittametropolitana. (2015). Infrastructure. Available: http://www.cittametropolitana.mi.it/economia/en/saperne/milano_cifre/sistema_infrastrutture/. Last accessed 29th March 2016. Cushman & Wakefield . (2015). EUROPEAN OFFICE FORECAST 2015-2017. Available: http://www.cushmanwakefield.co.uk/en-gb/research-and-insight/2015/european-office-forecast-2015-2017/. Last accessed 31st March 2016. Cushman & Wakefield . (2015). European Snapshots Retail Q1 2015.Available: http://www.cushmanwakefield.co.uk/en-gb/research-and-insight/uk/european-marketbeat-snapshots-q1-2015/. Last accessed 2nd April 2016. 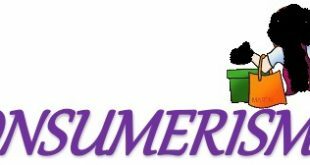 Ecommerce News. (2015). Amazon launches Amazon Prime Now in Italy. Available: http://ecommercenews.eu/amazon-launches-amazon-prime-now-in-italy/. Last accessed 2nd April 2016. EULERHERMES. (2015). EULER HERMES STUDY: EXPO MILAN 2015 – THE END OR A FRESH START?. Available: http://www.eulerhermes.com/mediacenter/news/Pages/press-release-Euler-Hermes-study-Expo-Milan-2015.aspx. Last accessed 31st March 2016. Expo-Elements. (2015). Participants & Pavilions. Available: http://www.expo-elements.net/index.php/project/expo-2015-pavilions/. Last accessed 30th March 2016. Expo-magazine. (2016). http://www.expo-magazine.com/inside.asp?p=1036. Available: http://www.expo-magazine.com/inside.asp?p=1036. Last accessed 29th March 2016. Fessh. (2015). Visit Milan. Available: http://fessh2015.org/index.php?c=24. Last accessed 1st April 2016. Knightfrank. (2015). Milan Office Market Outlook. Available: http://content.knightfrank.com/research/698/documents/en/q4-2015-3401.pdf. Last accessed 1st April 2016. Language Monitor. (2014). New York Takes Top Global Fashion Capital Title from London, edging past Paris. Available: http://www.languagemonitor.com/fashion/sorry-kate-new-york-edges-paris-and-london-in-top-global-fashion-capital-10th-annual-survey/. Last accessed 29th March 2016. Marchesini, E. (2016). AXA bets on office and commercial real estate market. Available: http://www.italy24.ilsole24ore.com/art/real-estate/2016-01-11/axa-bets-on-italian-real-estate-market-182113.php?uuid=ACbk2q7B. Last accessed 1st April 2016. TradingEconomics. (2016). Italy Unemployment Rate . Available: http://www.tradingeconomics.com/italy/unemployment-rate/forecast. Last accessed 30th March 2016. UniBocconi. (2015). Bocconi and Rankings. Available: http://www.unibocconi.eu/wps/wcm/connect/Bocconi/SitoPubblico_EN/Navigation+Tree/Home/About+Us/Rankings/Bocconi+and+Rankings+home. Last accessed 30th March 2016. Scrivener, E. (2015). Top 5 shopping streets in Milan. Available: http://www.globalblue.com/destinations/italy/top-five-shopping-streets-in-milan/. Last accessed 2nd April 2016. Statista. (2015). B2C e-commerce sales in Italy from 2014 to 2017 (in billion U.S. dollars). Available: http://www.statista.com/statistics/239068/b2c-e-commerce-sales-in-italy/. Last accessed 5th April 2016. Statisticstimes . (2015). List of European countries by GDP. Available: http://statisticstimes.com/economy/european-countries-by-gdp.php. Last accessed 29th March 2016. World Bank. (2014). GDP per capita, PPP (current international $). Available: http://data.worldbank.org/indicator/NY.GDP.PCAP.PP.CD. Last accessed 29th March 2016. WILCO. (2013). CITY REPORT: MILAN. Available: http://wilcoproject.eu/wp-content/uploads/2013/04/WILCO_WP3_Milan_23.pdf. Last accessed 28th March 2016.